About OSR generally and GURPS Dungeon Fantasy specifically out of Malmö, Sweden. After finally finding a date which most of my players could attend they set off for another delve, this time scheduled for a whole day instead of just a half like last time. First off, I took a moment or two to let Amore account for his actions during the week that had passed since the rest of the party last saw him (he missed the first session so I thought I'd give him a chance to present himself while the other two were occupied with spending the XP they recieved last session). While the rest of the group gathered some minor quests and rumours in town and then set off to scout the caves he basically set off on a path of seduction, starting off with the tavernkeepers daughter. When she agreed to take him on a walk and show him the keep surroundings he snubbed her to spend the night with a warrior woman named Steira that he met on the caravan. On the next day he finally met with the keep commander like Boerge had done the day before and among other things promised him not to touch his daughter. Then he went to the travellers inn to look for Steira again but got the attention of the stableboy Godrick who after some flirting took take him for a romantic ride on one of the stables horses outside the castle. Amore was careful not to take it further though for the time being and kept his distance to all of them until the party came back. When they were back from the first delve a week of rest was sorely needed for Ernst though who had hurt his arm in a brawl with some rats, after a few days he also got down with the sewer rot which was swiftly cured by Father War who in turn he got sick and could not follow the party out on their second delve. They gathered a few more more bits of information about the Caves but not much they didn't already know. When they left the first time the rain was pouring down and they quickly decided to go back, rest another day (paying another $20 upkeep each) to see if the weather was better the next day, it was! They decided to use the same campsite as they had done the last time but when Ernst scouted it out he was spotted by a couple of undead that seemed to be guarding the place. Not wanting to take any risks or get into any unneccessary fights they decided to set up camp a bit further down the road instead. The next day they walked for another few hours, camouflaged their wagon about an hours march from the Caves and set Sture to guard it and then walked the last hour. Ernst failed his Observation-roll and saw nothing out of the ordinary down the slopes of the old stripmine. Boerge critfailed his Strategy-roll which resulted in them running straight down the slope to get to one of the south side entrances. Ernst fell on the way down but didn't hurt himself, a few surprised gnolls at another entrance about twenty yards away growled and stared with beady eyes at them as they ran by. Inside the entrance a cavern opened up with further openings in all directions. In the mud covering the floor at the entrance to the cave footprints of small, humansized and big humanoids could be seen. 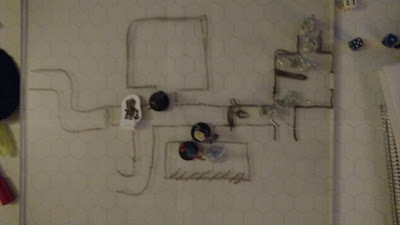 From the left opening there was steps carved out in a slope leading downward, the party started down but turned around when they heard noice coming from the middle one, they also heard a snoring, growling sound from down the steps similar to the ones in the owlbear cave. Back in the entrance cavern they met a group of goblins on patrol which they made short work of: Boerge smashed a face in with his flail, Ernst pierced the throat of another with an arrow, a third one hacked down by a flurry of blows from Amores shortswords. 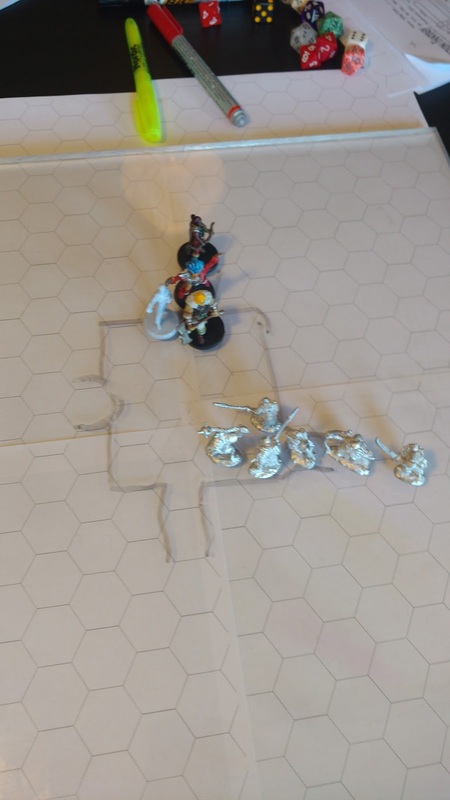 The rest of the goblins broke and started fleeing, one of them got shot in the leg but two were heard running down a flight of stairs further inside the middle cave. Now the party went back to the steps they'd started down before they were interrupted, on their way down a sour odour was spreading and when they had Ernst peeking inside the opening at the end of the steps the only thing he noticed was the contour of a sleeping bear beside piles of tattered cloths and animal bones. They decided to let that particular cave be for the time being and headed back up towards the entrance. Goblinfight starts, cave entrance is to the left. Instead of following the fleeing goblins they noticed a skull of a humanoid hanging from the wall in the third opening which proved to be a passage with additional skulls leading to a robust door without a lock. On the door was a message written in broken common: "Welcom! We woud lav to hav you for diner.". The group failed to read this as anything else than an invitation to a restaurant, possibly even giving away the food for free and ensthusiastically knocked on the door and a wierd conversation ensued (Disadvantages such as No Sense of Humor, Honesty, Gullibility and Overconfidence doesn't help in these kinds of situations). - "Av' you booked reservations?" - "Am sorry, we only av' room fer two at the moment, you other wait outside." - "Wa' name shall I put you on?" - "Mkay, come in, ba only two o' ya, okay?!" A bar was lifted on the other side of the door and it was unlocked and a large hobgoblin opened and let Boerge and Benny in and barred the door behind them. Around this moment Boerge and Benny finally realized that it might be a trap and told the bouncer politely that they wanted to leave again, he refused and told them to move on in to the cloakroom to get their weapons and armour checked in. When Boerge tried to force himself out he shouted "Guards!" and another two hobgoblins with crossbows pointed at Benny showed up from the "cloakroom". Benny convinced Boerge it was useless to resist and they started giving away their weapons while commenting on the bad service of the establishment. Meanwhile Amore and Ernst heard the commotion from the other side of the door and knocked again, the bouncer unbarred and unlocked the door, inched it open and asked what all the fuzz was about. They asked if they could at least see the menu while waiting but he told them to wait for their turn and slammed the door shut but forgetting to lock and bar it. Ernst took a peek inside and now realized that Boerge and Benny were being taken captive and decided to engage the bouncer that had turned back to face Boerge. The bouncer was taken out quick with two consecutive bodkin arrows in the back from point blank range while a disarmed Boerge took a bolt straight through the hand of his shield arm, crippling it and continuing through the chainmail into his abdomen, ouch! Before he had time to fight back he took another blow to the same hand from a dogslicer while Amore ran straight through the pack and made short work of the other crossbowman (first his three hits barely made a scratch, then we realized he'd forgot to add bonus damage to his shortswords from Weapon Master which resulted in an unconscious hobgoblin instead). The guard with the dogslicer held his ground well for a good five turns using a shield and incredibly good active defence rolls to enable two guards behind him throw a few spears, none finding a target though. When his shield finally broke he was put down and the fight ended with the crossbowman who shot Boerge begging for mercy but recieved none, his face was duly slammed in by Boerges flail. Boerge put his shield back on and recieved some quick treatment on his hand from Ernst, Benny had to use Serendipidy to find a used first aid kit in the room since noone in the party had brought one. After inspecting another closeby door (it was locked), they started discussing just taking what was on the guards (which wasn't much more than their weapons basically, they had a few gold coins though) and leaving, I was nice and informed Boerge about his Forced Entry-skill which he made instant use of, forcing the weak door open and finding the Hobgoblin Armory, all of a sudden there was more loot than they could carry in one go in the form of weapons and armour that seemed to be pretty much all human-made, the prize item being the commanders lost Plate Mail! Just as everyone had entered the armoury the inspect the goodies they heard shuffling from further down the corridor, they just managed to get into formation again before another two hobgoblins came at them, they almost immediately drove them back though and when Boerge gave chase he was met with a volley of bolts coming from another guard room at the end of the corridor which he just managed to dodge before diving back into the corridor for safety. Corridor in the center, barricaded, The fallen bouncer lies by the entrance to the left. After that it was late and they decided to barricade the corridor and carry with them as much and as valuable loot as they could carry. They managed to salvage a total of three crossbows, three chainmail shirts which seemed a bit special though noone knew exactly what it was (all the players insisted it was probably mithril), the plate mail and a couple of swords of different kinds. Nothing much happened on the way back except that they went through the forest instead of on the road for the first day and Ernst failed a navigation-roll which made them spend almost a whole extra day getting back. Outside of town they once again met the sickly elf begging and threw him the copper coins they hadn't bothered counting. Inside town they sold all the weapons and one of the chainmails to the armourer who couldn't see that there was anything special with it. Amore asked if any of the other two fit him and one of them did (he has pretty much the same frame as who they were made for so I let it fit him on a five or six on 1d). When the beggar-elf was shown the last chainmail his eyes filled with tears and he explained that it is elf-made and was worn by one of his lost elf-companions when they tried their luck at the caves a few weeks before. He asked if he could keep it and the party first hesitated but then gave in to his teardraped elf-eyes and gave it to him. Even though they didn't manage to salvage more than maybe one fourth of everything in the armoury the loot was still much better than last time, earning all PC's present three points each and another one from exploring. I also rewarded another point to Ernst player for her roleplaying in getting past the hobgoblin entrance which was a bit wierd but great fun. MVP was also rewarded to Ernst player.